SPOKANE, WA, October 08, 2018 /24-7PressRelease/ — Sunshine Farm is the newest addition to the Green Bluff farms north of Spokane, specializing in fresh eggs, black currants and garlic. Owners Ginger and Michael Kulpit held their grand opening at 6312 E. Rae Lane at the end of July and business has been booming ever since. They’re already planning to expand next year. “We’ve sold out of some of the garlic,” Ginger Kulpit said. The couple grow several different types of garlic, and Michael Kulpit is already making their garlic plot larger. The black currants, small berries about the size of a blueberry, are very common in Europe but not the United States. “Most of our customers for the black currants are Europeans who have immigrated,” Ginger Kulpit said. It was always Michael Kulpit’s dream to have a farm. Though he spent 24 years in the Navy as an independent duty hospital corpsman and another 12 years in civil service at the Puget Sound Naval Shipyard and the Spokane Veteran’s Hospital, he has always wanted his own farm like the one he grew up on. 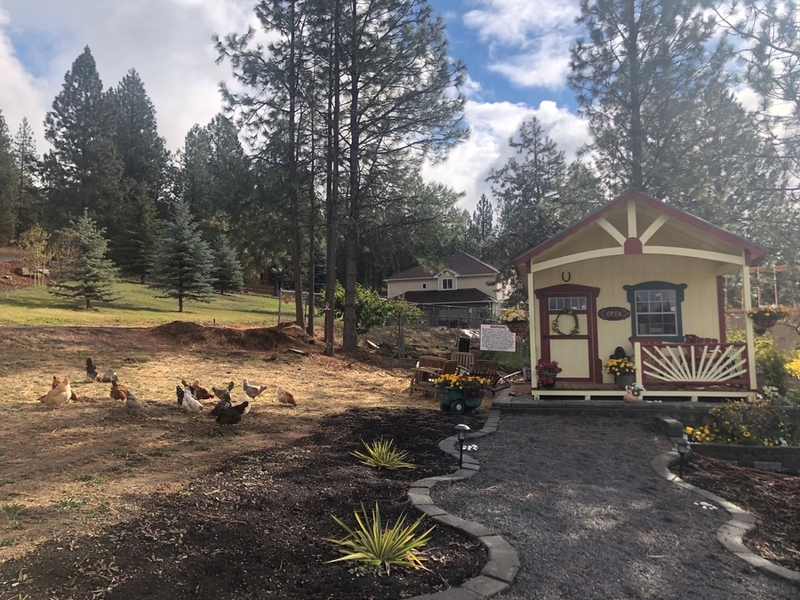 The couple bought 10 acres on the western edge of Green Bluff and the property came with a chicken coop, so they thought they’d get a few chickens, maybe five or 10. They left the store with 40. “We didn’t know which ones to get so we got two or three of each,” said Ginger Kulpit. The chickens have a fenced area near their coop, but they spend most of their time scratching and pecking around the property. They’ve been good egg suppliers, and the couple are already working on a bigger chicken coop and plan to expand their flock to 100 hens. Visitors can feed the chickens if they like. When they’re not plucking bugs out of the grass they eat organic, non-GMO feed that is corn- and soy-free. The couple also sell garlic scapes, which are the green stem of the garlic with the flower bud attached. They can be used to make pesto or in other recipes. There are also berries visitors can pick, including raspberries, white table grapes and a couple of pear trees to offer a late season treat. The couple put a small cottage next to the road that serves as the headquarters. They sell wooden cutting boards and trivets made by Jackson Wood, purses and baskets made by PJ’s Bags & Baskets and giant metal leaves by Leaf It to Me. The metal leaves can be used as wall art or as plates, Ginger Kulpit said. They also sell canned items made by Gourmet Gardens in Texas. The couple don’t have the cottage license required to can their own goods and are selling them to test the waters. Hours: Open 9 a.m. to noon Tuesday and Thursday and 9 a.m. to 1 p.m. Saturday. Additional hours may be added if there is enough demand. The farm is also open by appointment. Phone: (509) 904-5731 for information or appointment. Directions: The easiest way to reach the farm is to go north on Highway 2 from Spokane and turn right on Greenbluff Road, left on Hardesty Road and then right on Rae Lane.